Pond Builder in the Nashville Middle Tn area. 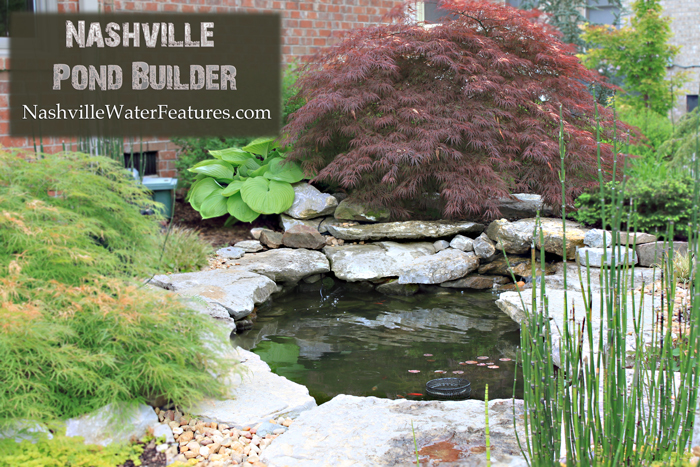 Image of a beautiful Pond in Brentwood Tn that says in text Nashville Pond Builder. We would like to build your pond. 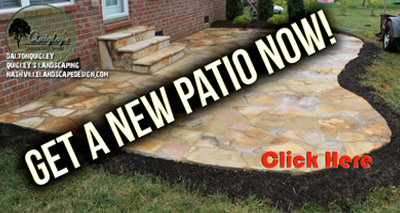 Quigley’s Landscaping is committed to building the finest landscapes in the Nashville Tn area. We have great local contacts for all of the Stone, Liners, Pumps, and Koi fish. 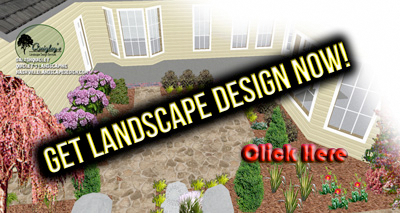 We can design the pond with you to help you understand what you need to know. Imagine beautiful natural stone, water garden, possibly a colorful Japanese Maple, and some lillies, a waterfall, and wonderful colorful Koi fish swimming around. Doesn’t that sound relaxing? From the above image you can clearly see a photo in the bottom right with the large letters stating Before. This waterfall / pond was made with the incorrect pump, hosing, spillway ( which was home made with duct tape and mortar ) and so it leaked and the client asked for help with making it look like a proper pond and waterfall. 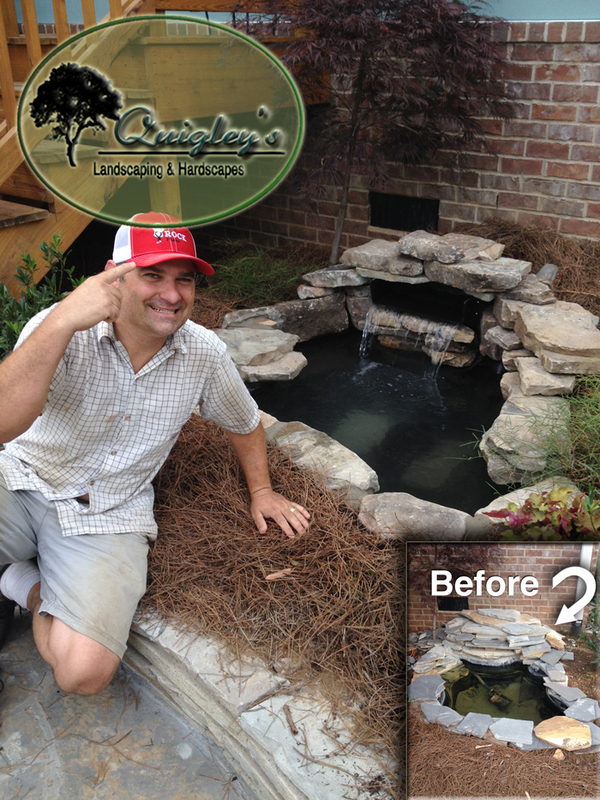 We completely changed the look of the pond to what the client would have originally asked for. The use of the thin flagstone for all portions of the outer stone look is totally wrong for this application. The difference is striking when the right materials are used. We would start a pond quote by looking over the site with you and evaluating your needs. 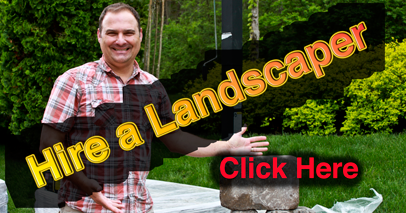 Will a pond fit in your yard? Do you have time to maintain a pond and who can you turn to for servicing? Do you like plants? How about a beautiful Lotus growing in your pond? 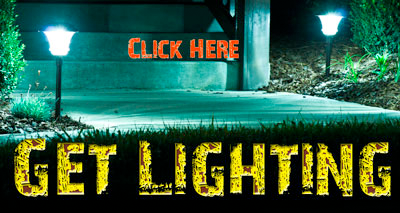 sounds of falling water into your yard or even a pond that has a fountain with lights. We also service Franklin, Brentwood, Thompsons Station, Spring Hill, Smyrna, Murfreesboro and more areas of Nashville. Contact us to find out if we service your area. animals will eat the fish if they are not protected. We are pond builders in Nashville go to our contact page.